If the region of Galicia were a state in the U.S., it would have to be Arkansas, if only for the state motto, The Natural State. Rugged, forested, and a little hilly, Galicia has in my opinion the most beautiful countryside in Spain. Not only does the region have gorgeous coasts and beaches, it also has simply wonderful interior landscapes. 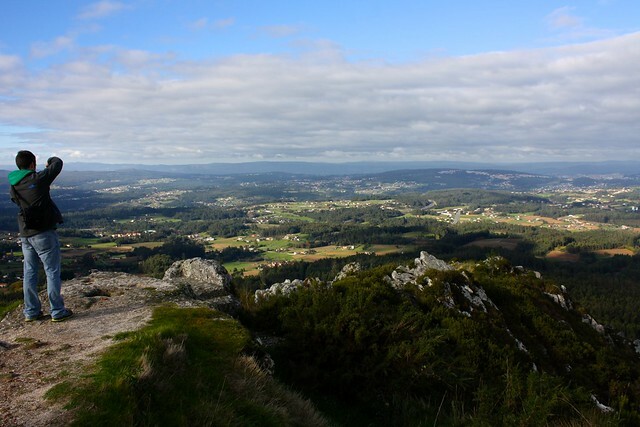 Living in Santiago de Compostela has given me a chance to get a taste of Galicia’s natural beauty by means of various hiking trails and mountain summits. You can see most of Santiago’s old town in around a day, so if you’re ever passing through here definitely take some time to leave the city life for the outdoors! The “Stony Mountain” rears up directly northwest of the old town, and is even visible from the central Praza do Obradoiro, just past the Parador hotel. 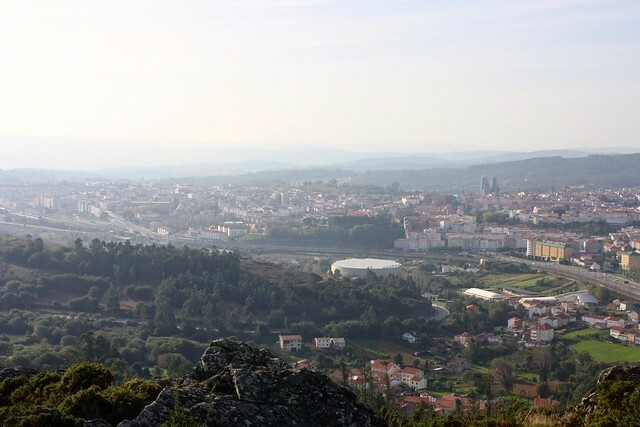 If you’re short for time but are looking for that panoramic photo shot, Monte Pedroso is the place to go. 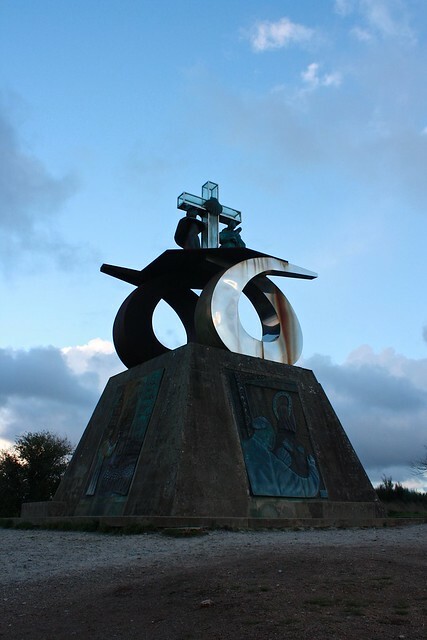 Starting from the cathedral, it only takes one hour to hike up the gently-sloping hillside, and the summit is wide and spacious with several radio towers and maintenance buildings to keep you from getting lost. Just beneath the summit is the friendly Parque da Granxa do Xesto, a great place to have a picnic or cookout or even an afternoon coffee before you finish going up to the top. Monte do Viso is similar to Monte Pedroso but on the other side of town to the east, so the panoramic views from up top are similar but reversed. It’s fairly difficult to get to as it’s in the middle of nowhere, past family farms, across the highway, and through a forest—so bring your smartphone so you don’t get lost. The “viso” part of the name is a Spanish and Galician word that means “height or elevation, high point or place, which you can see and describe a lot of terrain from” (thanks RAE dictionary!). A lonely and unforgiving summit, yes, but a good place from which to take in the expanse of the modern city of Santiago. The “Joy Mountain” is called so because in the Middle Ages, when pilgrims made their way west along the Camino de Santiago, Monte do Gozo was the first place they could catch a glimpse of the soaring bell and clock towers of the cathedral: the long-awaited goal they had spent weeks walking toward was finally within reach. Today it’s kind of a letdown because tall trees and modern apartment blocks hide the view of the church until you get to Rúa de San Pedro. Nevertheless, Monte do Gozo is still a highly significant place in Santiago, and from this spot St. James’ shrine is only an hour away on foot. To get your feet wet in what it means to be a pilgrim, take city bus #6 to the end of the line and hike the final five kilometers back to the cathedral. 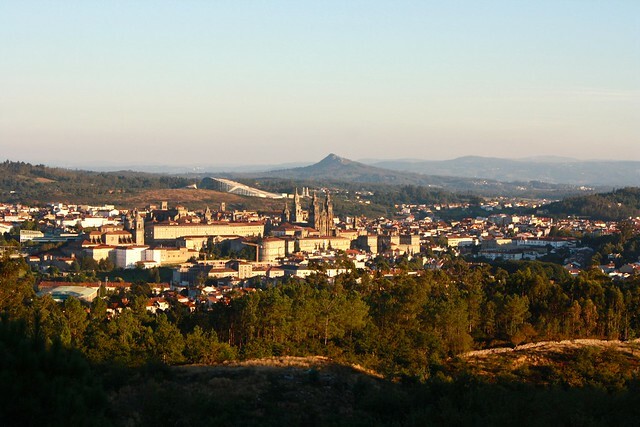 “Sacred Peak” isn’t within Santiago’s city limits, but instead in the parish of Lestedo (Boqueixón) 12km southeast on the highway to Ourense. Pico Sacro is a 533m-high mountain with a sharp, conical peak that is unmistakable when viewed from Santiago. It makes a great daytrip and day-hike (uh, one-hour-hike); simply take the Monbus to Lestedo and ease up the forested mountainside until you reach the serrated summit, which has some interesting rock formations and even a hidden cave. Don’t head back to Santiago without trying a slice of tarta de Lestedo or local cheesecake! Another hike I like to recommend to friends is simply heading west from the Praza do Obradoiro and following the yellow arrows and shells pointing to Fisterra, “Lands End” on the west Atlantic Coast. While the Camino de Santiago officially ends at the cathedral, a secondary Camino de Fisterra continues west to the coast to what the ancients believed was finis terræ—the end of the world. Granted, it takes three or four days to get to Fisterra on foot, but the 19km stage to Negreira at the end of the first day is only four hours of straight walking, and you get to see a beautiful cross-section of Galician eucalyptus forests, rural homes, and pastoral scenes. 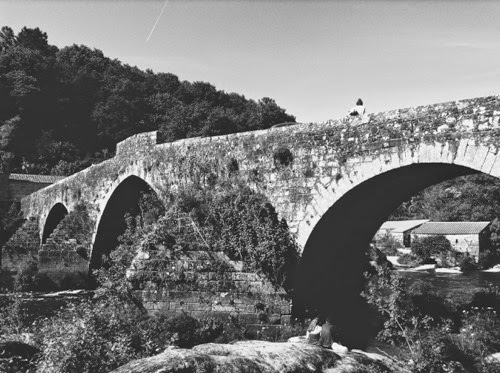 Just before you get to Negreira you pass over the Ponte Maceira, an impressive medieval bridge that spans the Tambre River. Several buses head back to Santiago from Negreira daily. Do you enjoy hiking for fun? Which of these hikes would you most be interested in doing? Cast your vote in the comments below!